A stripped down Marina Blue Dash. It's not Tuxedo Black but it's close enough. Turbo Camaro's factory interior color was Marina Blue. The only color more popular than Marina Blue was Bolero Red. The cars of today are mostly tan or black inside. The days of exciting factory color schemes have faded away. That being said, the essence of Turbo Camaro is to modernize without loosing the classic look and feel. So guess what? Black it is! In order to refresh your painted interior surfaces you need to remove anything in the way. In this case, the dash pad, steering wheel, instrument cluster, carrier plate, stereo, heater controls, ash tray, glove box, pillar molds and all the various knobs and doohickeys. Obviously pieces like the glove box will need to be painted as well, but separately. Once you've dismantled it all, you need to prepare the area for dust. Use plastic bags or drop sheets to mask off the floor, seats, console and anywhere else you don't want paint dust. To achieve great results, you'll want to sand the dash. Sanding will insure a smooth finish. If your dash is in perfect condition then you can get away with less sanding as you won't have scratches and chips to smooth out. That being said, if your dash is in "perfect" condition, why the hell are you going to all this trouble? A thorough application of 150 grit and then 220 grit was applied to the entire dash prior to cleaning with a wax and grease remover. If you don't have anything fancy, light bursts of Windex works. Be sure all sanding dust and cleaner residue is gone prior to painting. Sticker is just a faded brown stain now. Sticker placed but not applied. You get the idea. It is now time to retreive your chosen paint. Dozens of companies have come up with paint choices specific to classic vehicles, allowing you to factory match your paint, or get the exact paint code used on your vehicle. In this case, a Trim Black Semi-Gloss Etching Primer was used and then finished with Rustoleum Universal Gloss Black. Two things to keep in mind: first, your paint may not require a primer if it's amazing on its own. Second, the top of the dash was NOT painted (yet) as a gloss paint could potentially blind the occupants if the sun were to reflect off it. Consider a satin or even matte paint tone for the dash top. Since dash surfaces are mostly vertical, don't ignore the instructions on the can, spray multiple light coats. If you get eager and spray heavy you will cause runs and it'll look like crap, thus causing more work and touch ups. Exact copy of factory decal - Printer friendly. While the dash is drying, you can fetch the cast away parts like the ash tray and glove box. These parts receive the exact same treatment. Keep in mind some parts have stickers and knobs requiring removal prior to painting. 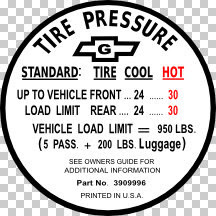 The 67' Camaro has a tire pressure information decal on the inside of the glove box door. The original decal was beyond restoration and would need to be removed forever or replaced. Upon sourcing the decal, it was discovered to cost $10 with shipping. Yep, that's $10 for a black and white sticker the size of a baseball. Instead, the decal was replicated word for word and printed it on sticker paper, cost about 10 cents in ink and paper. Probably took an hour to get the decal exactly the same as the factory one. The copied image is posted here for future reference. Perhaps someone else can save a few bucks.